The polyurethane additives market is projected to reach USD 2.75 billion by 2021, at a CAGR of 6.3%, in terms of value from 2016 to 2021. The base year considered for the study is 2015, while the forecast period is from 2016 to 2021. The polyurethane additives market is driven by increasing usage of polyurethane in the construction and automotive industries. 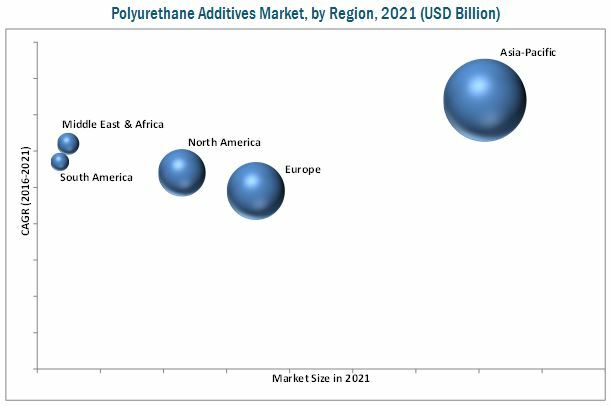 The report includes analysis of the polyurethane additive market by region, namely, North America, Europe, Asia-Pacific, the Middle East & Africa, and South America. Polyurethane is widely used as foams, adhesives, sealants, and coatings. The rising building and construction activities across the globe will drive the demand for polyurethane which will catalyze the demand for polyurethane additives as well. The demand for high quality polyurethane for high performance caotings and high performance insulation for residential and commercial buildings will drive the demand for polyurethane additives for imparting better characteristics to polyurethane. Both, top-down and bottom-up approaches have been used to estimate and validate the size of the polyurethane additives market and to determine the size of various other dependent submarkets. The research study involved the use of extensive secondary sources, directories, and databases such as Hoovers, Bloomberg, Chemical Weekly, Commonwealth Scientific and Industrial Research Organization (CSIRO), Securities And Exchange Commission (SEC), American National Standards Institute (ANSI), Organization for Economic Co-operation and Development (OECD), and other government and private websites to identify and collect information useful for the technical, market-oriented, and commercial study of the polyurethane additives market. In June 2016, Covestro AG is moving forward with an expansion of production capacity for the foam component MDI at the site Brunsbüttel, Germany. This expansion will add 400,000 metric tons of MDI per year of production capacity. In July 2016, BASF added an additional service for polyurethane systems in automotive interiors. BASF’s Ultrasim simulation tool has been expanded so that the behavior of PU systems during foaming can now be reliably predicted. In October 2015, Air Products and Chemicals, Inc. introduced a catalyst, Polycat 204, which is specifically designed for rigid polyurethane foam. This catalyst was designed to aid polyurethane foam producers to optimize the foam characteristics. This research report categorizes the polyurethane additives market on the basis of material type, end-use industry, and region. What is the market size of Polyurethane additives in various application across different countries? The global polyurethane additives market is projected to reach USD 2.75 billion by 2021 at a CAGR of 6.3% from 2016 to 2021. The market has witnessed significant growth in the recent years, and this growth is projected to persist in the coming years. 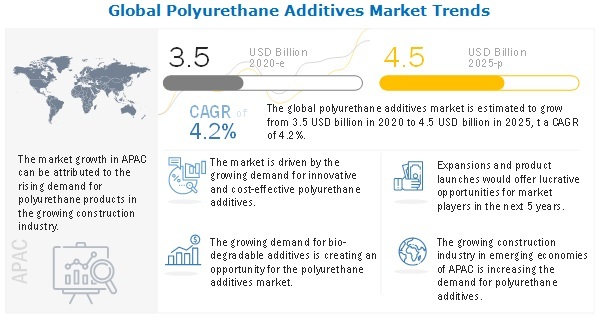 The growth of the polyurethane additives market is expected to be fueled by increasing use of polyurethane in various end-use industries such as automotive, building & construction, and other consumer products. Different types of polyurethane additives are included in the report. The main types are catalyst, surfactant, filler, and others. Polyurethane additives are used in various end-use industries such as automotive & transportation, building & construction, bedding & furniture, and others. 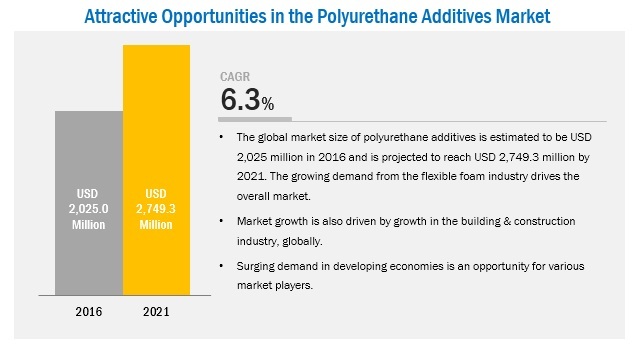 The building & construction industry is expected to drive the polyurethanes additive market, due to the increasing demand for polyurethane for insulation. Polyurethane additives are used mainly in flexible foam, rigid foam, coatings, adhesives & sealants, elastomers, and binders. Flexible foams are primarily used in bedding & furniture, and automotive & transportation industries. North America, Europe, Asia-Pacific, Middle East & Africa, and South America are considered the main regions in the polyurethane additives market report. Asia-Pacific region is dominant in the polyurethane additive market. The rising demand for polyurethane additives in this region is mainly driven by its increased use in building & construction industries. Europe is the second-largest consumer of polyurethane additives, globally. The market in this region is mainly driven by the growing opportunities from transportation and construction industries. The Middle East & Africa is the second fastest-growing market, due to the increased demand for rigid foam for insulation purposes in the region. However, few factors such as volatility in raw material prices, increased pressure from regulatory bodies, and rising cost of production hinder the growth of the market, globally. Polyurethane foam can be broadly categorized into rigid and flexible foam. Rigid foams are manufactured using low molecular weight polyols while flexible foam use relatively high molecular weight polyols. Rigid foam is well suited for insulation purposes and, hence, is used extensively in buildings and constructions. They help reduce heating and cooling requirements in commercial housing. It can also be used extensively in various applications such as refrigeration. Polyurethane foams have also found applications for sound proofing purposes. Flexible foams on the other hand are extensively used in the automotive industry as cushioning material in seat foam, carpet overlay, arm rests, headliners, and for other trim products. Apart from being cost effective, they endure weather extremes effectively. They are also used in packaging. Polyurethane adhesives have wide-ranging uses in many applications. This is due to certain mechanical and chemical attributes they possess such as good flexibility, especially, at low temperatures and good adhesion to a wide variety of substrates. Polyurethane adhesives can be designed to meet the requirements of a particular industry. Polyurethane adhesives do have some limitations. They have low UV light resistance and low chemical resistance compared to epoxies. Polyurethane adhesives’ applications overlap with epoxies in some instances. Generally, polyurethanes are preferred over epoxies for their stability. Polyurethane sealants are typically used in industrial and construction settings. In most applications, they give comparable performance as acrylates, silicones, rubber. Sealants are of two types: plastic and flexible sealants. Plastic sealants exhibit plastic characteristics even after curing has been completed while elastic sealants show elastic recovery. Polyurethane coatings are predominantly used in automotive, transportation, building & construction, furniture, and footwear industries. Polyurethane coating is one of the most widely used type of coating materials which finds its use in numerous end-use industries. Polyurethane coating is renowned for its physical as well as chemical properties such as chemical resistance, heat resistance, high dielectric strength, good weatherability, and others. It is used in a wide array of applications, such as, concrete coating, coil coating, metal coating, plastic coating, fiber coating, wood coating, and others. Its highly desirable properties also makes it an ideal coating material in industries such as textile & apparels and electrical & electronics. Covestro AG (Germany), BASF SE (Germany), The Dow Chemical Company (U.S.), and Huntsman International LLC (U.S.) are the leading companies operating in this market. These companies are expected to account for a significant market share in the near future. Entering into related industries and targeting new markets will enable polyurethane additive manufacturers to overcome the effects of the volatile economy, leading to the diversified business portfolio and increase revenue. The other main manufacturers of polyurethane additives are Tosoh Corporation (Japan), Albemarle Corporation (U.S.), Eastman Chemical Company (U.S.), Kao Corporation(Japan) ), Evonik Industries AG (Germany), Air Products and Chemicals, Inc. (U.S.), and Momentive Performance Materials Inc. (U.S.). 12.10 Air Products and Chemicals, Inc.
12.11 Momentive Performance Materials Inc.